This high pressure pump is made of high grade tungsten steel, which is more durable than others that made of stainless steel. It is used for air driving cylinder and PCP cylinder, and suitable for tires of cars, motorcycles, bikes, inflatable kayaks, inflatable balls, etc. Compact size with folding base design, convenient and portable for easily carrying. 【3 Stage Pump】3 stage high pressure hand pump, pressure goes up to 4500psi, with smooth upward and downwards motion, which is more efficient than traditional pumps. 【Premium Material】Pump body with high grade 304 stainless steel construction, tungsten coating finish for ultimate fadeless and anti-rust performance.Precise pressure gauge for monitoring pressure level, safer and more reliable to use. 【Design】Ergonomic handle for comfortable grip, operation requires less effort. 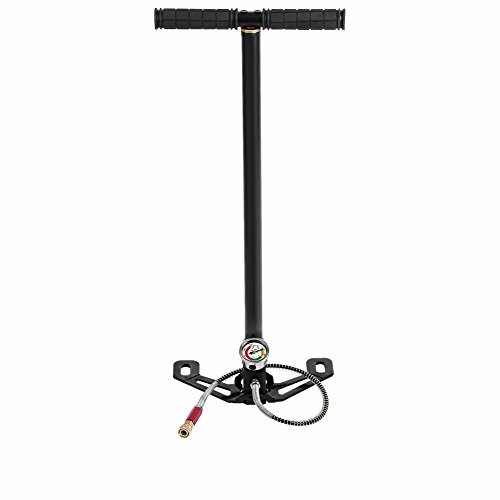 Precise pressure gauge for monitoring pressure level, safer and more reliable to use.Portable size and folding footplate, could be stored in car more space saving and carrying conveniently. 【Function】Built-in oil and water separation function, helps air filter system removes of harmful moisture.Bleed valve to prevent oil and water into your equipment, flexible micro-bore hose for convenient filling. 【Application】Comes with O-rings, full instructions and other complete accessories, suitable for PCP pistols, rifles and air guns, great for automobile tires, motorcycle tires, bicycle tires, inflatable kayaks, inflatable balls etc.